A student watches the Introduction to Law Video produced by TKA’s O’Keeffe Pre-Law Studies Director Denise Brown. 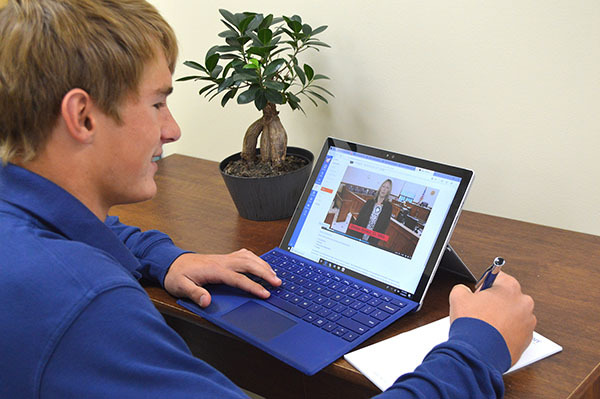 The O’Keeffe Pre-Law Studies program at the King’s Academy officially launched its online program on Jan. 9 by offering the first course in the series to students at Northlake Christian School in Covington, La. Students at Northlake Christian are taking the Introduction to Law course, a 14-week class providing an overview on law and the legal system from a Christian perspective. Additional courses are in development, with the second in the series, Criminal Law, launching fall 2019. The O’Keeffe Pre-Law Studies online program uses asynchronous learning to take students through a similar course of study as the on-campus pre-law program. The online courses were designed and written by Program Director Denise Brown and implemented into a learning management system by Rob Danley, director of information technology at TKA. Instructor Sarah Sherman serves as facilitator of the Introduction to Law course, which allows the resources of the O’Keeffe Pre-Law Studies program to impact students beyond the TKA campus. The online program will continue its partnership with Northlake Christian School and will be made available to other interested schools nationwide in the fall. For more information about TKA and opportunities provided through the O’Keeffe Pre-Law Studies program, call Admissions Director Amy Cuomo at (561) 686-4244.